Be the first to share your favorite memory, photo or story of Antonietta. This memorial page is dedicated for family, friends and future generations to celebrate the life of their loved one. 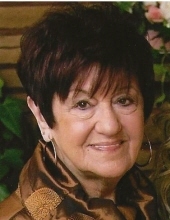 Antonietta C. “Toni” (Minerva) Meier, 87, of Bridgewater, passed away Monday, December 3, 2018, at the home of Mark and Susan Doherty under their special care. She was the wife of the late Kenneth B. Meier. Born August 7, 1931, in Brockton, she was the daughter of the late Nicola Minerva and Rosaria (Grilli) Minerva. Raised in Brockton, she graduated from Brockton High School in 1949 and then received her master’s degree in Education from Bridgewater State College. Antonietta was a school teacher for the Quincy School System for many years. She was a communicant of St. Joseph the Worker Parish in Hanson where she was a Eucharistic Minister. Auntie Netta was known for her devotion to her family. She enjoyed watching the Boston Red Sox and outings with family and friends. She is survived by her sister, Mary Tinto and her husband Guy of FL; her nieces and nephews, Donna Poliseno, Carol Minerva, Nick Minerva, Gerald Doherty, Mark Doherty, Rosemary Doherty Grosso, Joanne Eklund, Mark Tinto and Melisse Keegan; Godmother of Gerald Doherty and Dean Smith; she is also survived by many great and great-great nieces and nephews. She was the sister of the late Angela Piscitelli, Sabino Minerva, Italia Minerva and Lucia Doherty. Calling hours in the Russell & Pica Funeral Home, 441 South Main St., (Rt28) West Bridgewater on Thursday from 3:00-7:00PM. A Funeral Mass will be celebrated for the repose of her soul on Friday at 11:00AM in St. Joseph the Worker Parish, 1 Maquan St., Hanson. Interment will follow in Pine Hill Cemetery, West Bridgewater. In lieu of flowers, donations may be made to Cranberry Hospice, 36 Cordage Park Circle, Plymouth, MA 02360. "Email Address" would like to share the life celebration of Antonietta C. Meier. Click on the "link" to go to share a favorite memory or leave a condolence message for the family.